This article is by Guest Blogger Charlie Born, the newest member of the Shirman Group extended team. Studies are consistently showing that B2B buying habits are shifting. Buyers are now 60-70% of the way through the buyer’s cycle before they reach out to your sales representative. By that time, there is less need for traditional solution selling techniques. 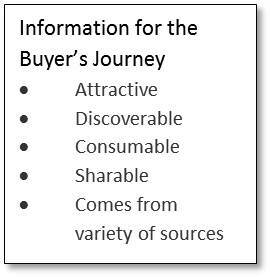 In the new buyer’s journey, the buyers believe that, based on their own research, they have figured out what they need. When they decide to contact your sales team, they have most likely decided you are one of their top three choices – you are 1 of 3. Maybe this sounds like good news. It’s not. Most often the buyer views all three choices as equally acceptable, and the final decision comes down to features, functions, support—and price, price, price. Exceptional sales representatives might be able to overcome this ‘1 of 3’ syndrome, but this is the antithesis of where you want to be with solution selling. Are you experiencing this phenomenon? Has it changed your marketing strategy? Marketers are often the customer advocates in the company. At Google, Marketers not only evangelize the company externally, but also “play a big role internally in evangelizing on behalf of the customer,” according to Lorraine Twohill, VP global marketing there. Identify the skills your team will need in its future role. As you outsource leading edge techniques and tactics to 3rd parties, pay attention to which specialists and skillsets they have on the team. Consider hiring people who have an in-depth understanding of your customer, but from a very different perspective and background than the existing team. Now that digital marketing has permeated go-to-market activity, what technologies will marketers adopt next to add some bleeding-edge luster? Seems the answer is the same as for everything else in tech these days: intelligence drawn from big data. Nora Denzel believes that “social media, smart mobile devices, and [intelligence gleaned from big] data will create a real market of one.” Intuit is already looking at ways to combine transactional, behavioral and social user-generated data to better serve customers. The company already offers new customer value by aggregating data across tens of thousands of businesses to create an employment and revenue index for small businesses. Is you company using data about customers or product usage to provide extra value to customers? The proliferation of SaaS and Apple’s demonstration of the impact of product design and user experience, have changed how marketers and their companies look at products. The lines between product management, product development, marketing, and sales are disappearing as quickly as chocolate from my kitchen. At a recent Churchill Club CMO panel, Nora Denzel, Senior VP, Big Data, Social Design and Marketing at Intuit articulated this trend best with the comment, “our product IS the funnel.” She described that Intuit customers make decision based on product use, not marketing messages. Their experience in using the product determines whether they spend money on it. That should be old hat to anyone offering a freemium model, but may not be explicitly understood by companies new to the products as services environment. Even more traditional products are evolving to play a bigger role in sales and marketing. Interactive TV guides provided by carriers upsell on-demand channels and premium content, toys include complimentary on-line gaming components that cross sell more toys, and grocery packaging offers recipes that promote sister brands and products. Product architecture, design, and/or manufacturing process that allow fast and easy modifications, feature additions, and integration of complimentary products. Please share your examples of products with built-in sales and marketing. In 42 Rules for Growing Enterprise Revenue, I talk about the fact that customer relevance is a corporate skillset, not a departmental one. Creating a positive, customer-relevant experience involves many parts of the organization, and the speakers at the recent Churchill Club CMO panel provided lots of validation and great examples of why shared ownership is critical. Nora Denzel, Senior VP of Big Data, Social Design and Marketing at Intuit commented that Intuit’s CIO, sales, and marketing all contribute to create the customer experience. Lorraine Twohill, VP of Global Marketing at Google agreed that cross-functional collaboration is critical because while Marketing focuses on customer acquisition, keeping customers and making them happy is what sales, support, and IT (in a SaaS company) do. Jonathan Becher, CMO at SAP, summed it up well. “The SAP experience is about the company, it’s not a marketing thing. If it were, no one would pay attention,” he commented. Bottom Line: Consider making great customer experience an objective for every organization that impacts it. Ask each functional team to identify specifically how they affect customer experience. Set detailed objectives in your annual and quarterly plans for how they can improve the department’s contribution to a great customer experience. Identify opportunities for cross-functional initiatives to offer new value to customers. It’s these that often have the greatest impact. Please share how different parts of your company are collaborating to serve customers better.